Arthur Evans, the wealthy son of pre-historian John Evans, was’ a man of independent means’ who did not need to earn a living. After completing his education at Harrow and Oxford, he travelled widely in the Balkans, and made a minor name for himself as the Manchester Guardian’s special correspondent in Bosnia and Croatia. 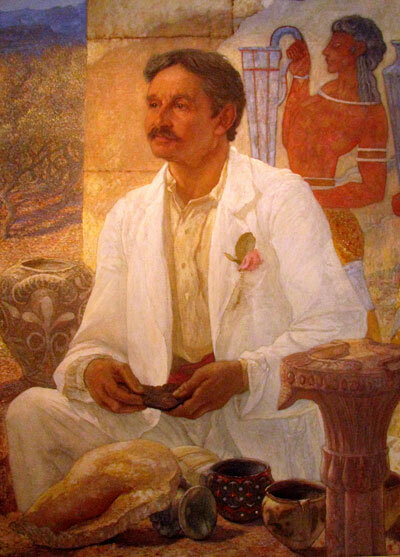 During this time, he studied Balkan antiquities, and on returning to England, he became Keeper of the Ashmolean Museum in Oxford, from l884 to l908. 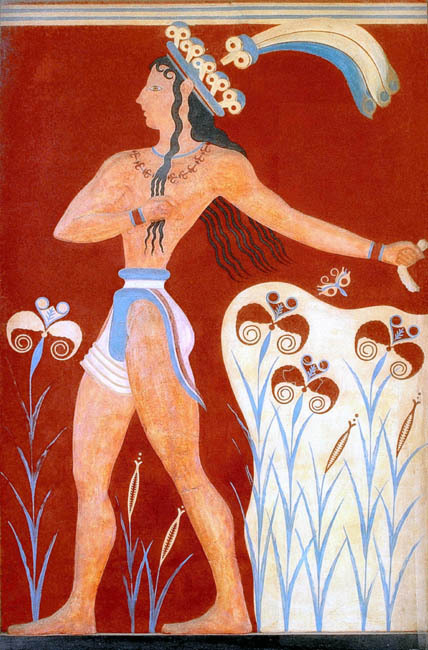 His interest in Knossos had been triggered by a visit to the site in l894- a visit made in pursuit of seals with mysterious hieroglyphic writing that were turning up in the markets of Athens, and that purportedly came from Crete. Results surpassed all expectations. Evans revealed a vast palace complex of Middle Bronze Age date (c.l900-l450 BC ) ,establishing that a distinct ‘Minoan’ Civilization on Crete had preceded ( and heavily influenced) the later ‘ Mycenaean ‘ civilization ( c l650-ll50 BC ) on the Greek mainland. 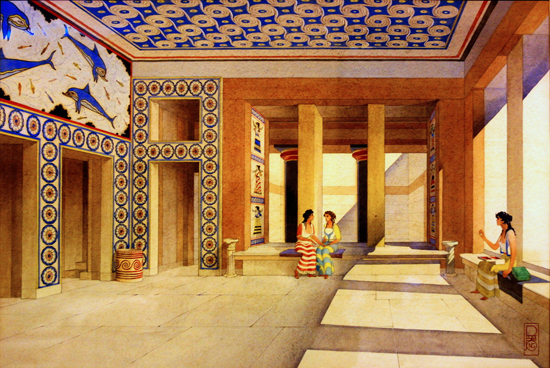 It was during the ‘ Second Palace Period ‘ ( c l700-l450 BC ) that Knossos reached its zenith. The palace complex included a central courtyard, a secondary western courtyard, a suite of royal apartments, a throne room with carved gypsum throne, and extensive store rooms and workshops. About l,300 rooms were connected by a network of corridors. The rooms of the royal apartments were stacked three or four storeys high, and served by light-wells, water pipes, drainage, and a grand staircase. The royal apartments, along with some other grand rooms, were decorated with elaborate, and colorful wall- frescoes , depicting dolphins, flying fish, griffins, court ceremonies and rituals, and sports such as boxing and bull leaping. The ground- floor and basement storerooms were notable for their many stone boxes and ceramic storage-jars ( pithoi), containers for the produce needed to support a court and royal administration which may, judging by the evidence of Linear B inscribed tablets found at Knossos, have numbered more than 4,000 people. 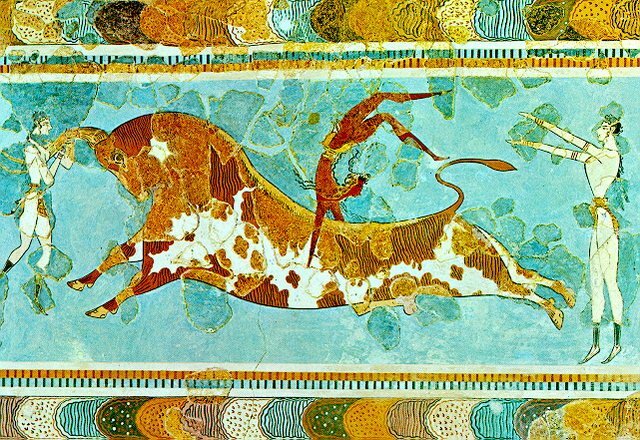 The famous Greek myth of Theseus, the Minotaur, and the Labyrinth contains two interesting clues about Minoan civilization and its relationship with mainland communities. First, the Labyrinth itself seems to have been some sort of folk memory of the great palace revealed by Evans’ excavations. Second, at the heart of the fable is the requirement that Athens send seven boys and seven girls to Crete every nine years to be eaten by the Minotaur. This may represent a former tributary relationship between Athens and Knossos. What is in fact certain that the archaeology of Knossos strongly implies a tributary economy based in maritime power. The development of a hieroglyphic script (Linear A) to inscribe clay documents is evidence for complex bureaucracy. Though Linear A, the true Minoan script, has not yet been deciphered. Linear B used by the Mycenaeans and represented in the latest layers at Knossos, has been. These texts undoubtedly amount to the ancient equivalent of modern tax records. 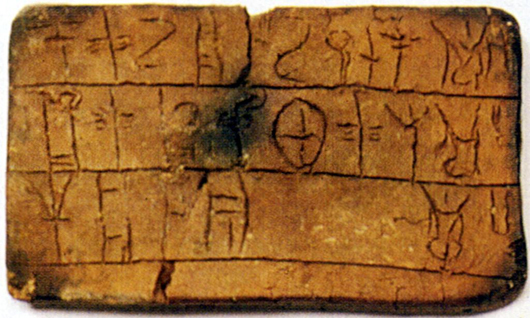 Linear B Tablet Knossos Found by Arthur Evans.